A site is just as good as the quality of its content, and posting well-written, original articles and tutorials that will benefit the reader is paramount. Avoid making the common mistake of copying blocks of text from other sites or blogs, as this will only determine Google to penalise yours. If Google detects plagiarized content on your site, not only will it lower the overall ranking, but it will also take its toll on the site's position in SERP (search engine results pages). It is also recommended to write for your readers, not for the Google crawlers - do not try to insert keywords where they do not fit, and avoid keyword stuffing at all costs. Also, make sure to double check your spelling and grammar, as the latest Google algorithms are designed to analyse not only the originality of the text, but also its quality. 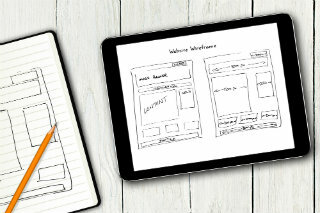 If you have some web design skills, then you surely know how important responsive web design is. Simply put, this type of design will make your personal site more versatile, thus allowing visitors to access it not only from their laptops, but also from their tablets or smartphones. This is a Google-friendly move that will also increase the traffic to your site in the long haul. Also, make sure that the HTML and the CSS are both properly validated, and that both the images and the scripts are optimised for mobile users. Did you know that all of the Kommand templates are mobile optimised? We aim to deliver the best web practice tools to make your website technologically advanced and customer friendly. Kommand enables you to build your own website using the most innovative web techniques without any technological or code knowledge. You can easily build your site within a day and showcase your talents, services or products on the World Wide Web. Google Analytics is a handy application designed to track your site visitors, and it will help you if you decide to either start an online marketing campaign for increasing the visibility of your website, or if you decide to monetize it with, say, Google AdWords. Last, but surely not least, another aspect of utmost importance is to make sure that your blog or site is search engine optimised. If you do this, Google will place it higher in the search engine results page (thus leading to an increase in the number of monthly visitors). Yet again Kommand guides you through the search engine optimization process pointing out which fields need to be filed whilst building your website. There are two main types of SEO: on-site (keyword optimisation, Meta tags and descriptions, metadata, XML sitemaps or reciprocal linking) and off-site (content-generated link building, guest posting, site reviews or social media sharing). There are several notable SEO techniques that you can use, even if you are not familiar with the topic. In addition to posting high-quality content, you should also consider guest posting (posting comments and entries on other sites or blogs from your niche), reciprocal linking, content marketing, social media promotion and such. If you would like to have your own website try Kommand.me building tool and design your website today!